It's high time the government 'of the people, by the people, for the people' has a county government that listens, understands, and has the best interests of its people in mind. 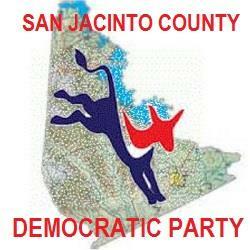 Join SanJacinto County Democrats in making our county a better, more inclusive place to live. Apr 18, 6 pm, Mike Collier speaks on school finance & taxes at regular mtg, Coldspring Com. Ctr.